PI wins new actuator contract from ESO for ELT telescope. High atop the Cerro Armazones in the harsh but extremely dry environment of the Chilean Atacama Desert, more than 2000 custom hybrid actuators will adjust 798 quarter ton segments in the primary mirror of the Extremely Large Telescope (ELT). 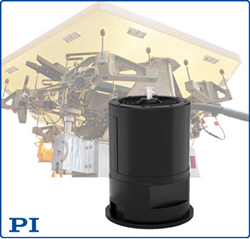 As a leader in precision motion control solutions, PI (Physik Instrumente) designed a new type of actuator that would meet the extreme requirements and win the European South Observatory (ESO) contract. PI’s ultra-precision actuator was developed to meet requirements such as: tracing performance better than 2nm RMS, force variation 0N to 900N, 15mm travel, minimized heat dissipation. Several concepts were simulated and tested before a winner was picked. The best results were achieved with a hybrid design based on the combination of piezo actuator, brushless motor, linear encoder and a hybrid controller to drive both the brushless motor and piezo actuator simultaneously based on the position feedback of an optical position sensor providing sub-nanometer resolution. Three actuators are required per segment. Why is this Precision Required? In order to perform similar to one 39m mirror (it is not feasible to make a single mirror of that size), all segments have to be aligned to each other to within nanometers all the time. The exact position of the mirror segments is influenced by several factors such as wind load, distortions, and vibration from the telescope structure, temperature fluctuations and varying gravity effects during tracking motions of the telescope. Smallest alignment errors between the mirror segments will degrade the optical performance of the telescope. How Large is Extremely Large? Touted as the largest telescope in the world, the 39 meter diameter ELT individual hexagonal mirrors measure 1.4 meters across and weigh about 500lbs each. The large aperture directly determines the light-collecting area, which in turn defines the exposure time. More area means that for a given amount of exposure time, the telescope can detect more distant (fainter) stars and look deeper into the universe. The ELT is scheduled to see its first light in 2024.